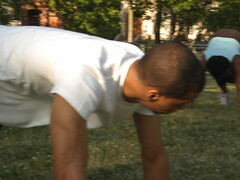 Bring a bottled water, towel, yoga mat and wear clothes that you feel comfortable busting a sweat in. Come have fun, lose weight, partner up with others and stay motivated at the 2nd annual Workout with Millionaire Fitness Camp. Scheduled after work, located in the park, and totally free, you can get in a great workout regardless of if you have a busy work schedule, are a single parent, or if you’re flat broke. No weights needed… just bring yourself, a yoga mat (optional), a towel, and plenty of water. Join us and learn how to use your body to improve your body – ensuring that wherever you are (vacation, a business trip, or at home), you’ll always have what you need to stay in shape… Yourself. NO shouting, barking out commands, and abusive training methods; we practice positive coaching – we only ask that you do your best. No money, no time, no baby sitter? NO EXCUSES! See you at the park. 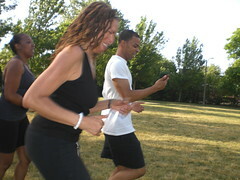 Our next boot camp takes place Monday, July 2, 2012.